The Cold Spring Harbor Laboratory (CSHL) has stripped James Watson, the 90-year-old Nobel Prize-winning scientist famous for determining the double-helix structure of DNA with his partner Francis Crick in the 1950s based on research conducted by British chemist Rosalind Franklin, of all his honorary titles after the laboratory deemed his recent remarks on race “reprehensible,” CNN reported this weekend. He should have stayed quiet and got busy with CRISPR like other people do. No, I'm wrong. I'm sorry. I think what the Cold Spring Harbor Laboratory did is terrible. From what I've read James Watson is right. He shouldn't be punished for not being politically correct. The truth is the truth. Looks around for some popcorn. From what I've read James Watson is right. He shouldn't be punished for not being politically correct. The truth is the truth. James Watson first showed his character to the world in his book about the discovery that made him famous. Try reading it from the point of view of Rosalind Franklin, or anyone else than Watson and Crick; imagining that you are that other person. Then to the matter of his latest statement. There are lots of quibbles about the methods of testing used for these comparisons, and whether the people being compared have the same socio-economic status and so on and so on. But leaving all of those objections aside. 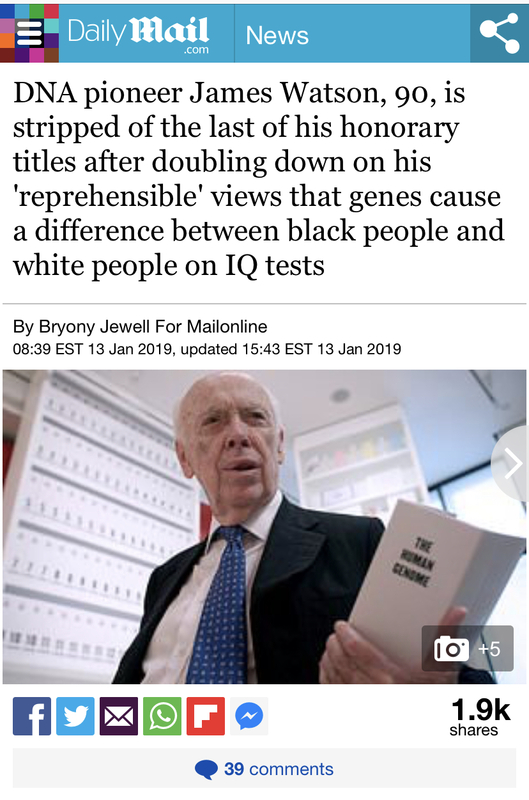 If you tried classifying someone from the general population for race just on their intelligence scores, there is so much overlap that you would be getting it wrong very often. Even on averages, something gets left out. Whenever these statistics put Caucasians above Afro Americans, they put Chinese above Caucasians. Until Watson makes that his headline,he is just manipulating statistics to support a bias. Last edited by Saetro; 01-15-2019 at 07:20 PM. I like to think about human intelligence. We are all a mixture of varying degrees. Any difference in intelligence probably comes from factors other than genetics. I am not inclined to strip people of past honors for more recent transactions, but good grief, don't push it man! Tbh. Even though I have no reason to believe he is right, since intelligence is obviously impacted by the "nurture", I do think lower intelligence isn't reprehensible or harmful if it doesn't strain resources. There are plenty of stone age tribes across Africa and Asia who live off the earth. It is as if they have to transfer ability in one sector to another, or shut off sympathy/empathy in order to succeed. Those who strive for the greater good of humanity in general often quite often expect the unquestioning sacrifice of those around them to achieve their own goal. "Flawed genius" is usually tautology. Expect bad behaviour - just don't give it credibility. *All studies so far have been on males. Based on personal anecdotes from my biology professors who met/assisted him at Cambridge, he was a very opinionated and "unpleasant" person. His opinions probably had nothing to do with his research. They inevitably become intolerable when made public. Last edited by Mandoos; 01-15-2019 at 08:04 PM. James Lick mtDNA tool - Accurate?